I started my sewing career as a child around the age of 7 or 8, in New Zealand, being taught by both my grandmothers how to make clothes. Working from the patterns of the 70’s and 80’s creating new outfits for myself, it not only taught me a useful skill, but I fell in love with fabric, textures and colours. In the early 90’s I saw my first quilt exhibition and just knew it was something I wanted to learn. In 1997 whilst my son was a baby I was able to attend classes in Bunbury and learnt how to make a Sampler Quilt. It teaches you different block designs, patchwork techniques and at the end you finish up with a whole quilt. That first quilt I made spent many years on my son, Bailey’s bed until he outgrew the design, and then as it slowly aged was adopted by our first family dog – Garvin. Where does this word QUILT come from? After doing a bit of a google search I discovered the word quilt actually comes from the Latin word ‘culcita‘ meaning a stuffed sack. It then made its way into the English language via the French word ‘cuilte‘. The actual origins and just when this all began aren’t totally known, but quilting, piecing and applique have been used in clothing and furnishings in many parts of the world since early times. It has been practised as a practical and decorative craft across the centuries. What is a quilt ? 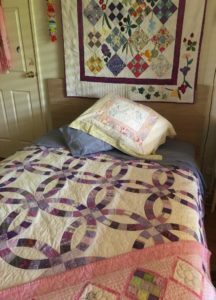 The quilt is the finished article and refers to an item made of three layers held together by the quilting or stitching of those layers together. The top layer is the decorative one, sometimes pieced, sometimes a whole piece of fabric or sometimes appliqued and embroidered. The middle layer is the wadding, in times past this was often what was at hand. Today we mostly use wool or cotton, although bamboo is becoming popular too. The final layer is the back fabric of the quilt, generally one piece, but sometimes this can be pieced as well. Patchwork is a term that usually refers to the piecing of fabric together to make a whole. It can reference a vast array of designs and blocks that have come about over time, the names are often reflective of the era, origins or design of a block. Rural references such as the Churn Dash Block, Rail Fence, and Log Cabin; the myriad of star designs – Ohio, Evening and Mexican Star are just a few ; Flying Geese, Spinning Wheels and Nine Patch are yet more of the well known block designs. When these designs are combined with fabric choices and patterns, amazing patchwork quilt designs are the result. Since 1997 I have embraced the patchwork and quilting world. Through this craft I have met many different people. I am constantly learning new things, and have made some lifelong friends. I’ve lost count of the quilts I’ve made for both family and friends. To me there is nothing better than getting together with like minded people and spending time creating with colour and fabric. There’s always lots of laughter along the way. I love making quilts for children, the brighter the better and I love needle-turn applique. (Cutting up small pieces into shapes and then appliqueing them onto a background to create a picture). 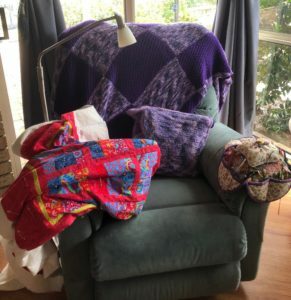 So I guess it’s not surprising that I found a way to connect quilts and wine. 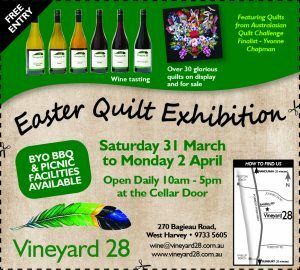 Our cellar door here at Vineyard 28 is a lovely warm and vibrant place, awash with colour and the creative works of some very talented quilters from my corner of South Western Australia. Our website features many of the quilts we have for sale at the cellar door. 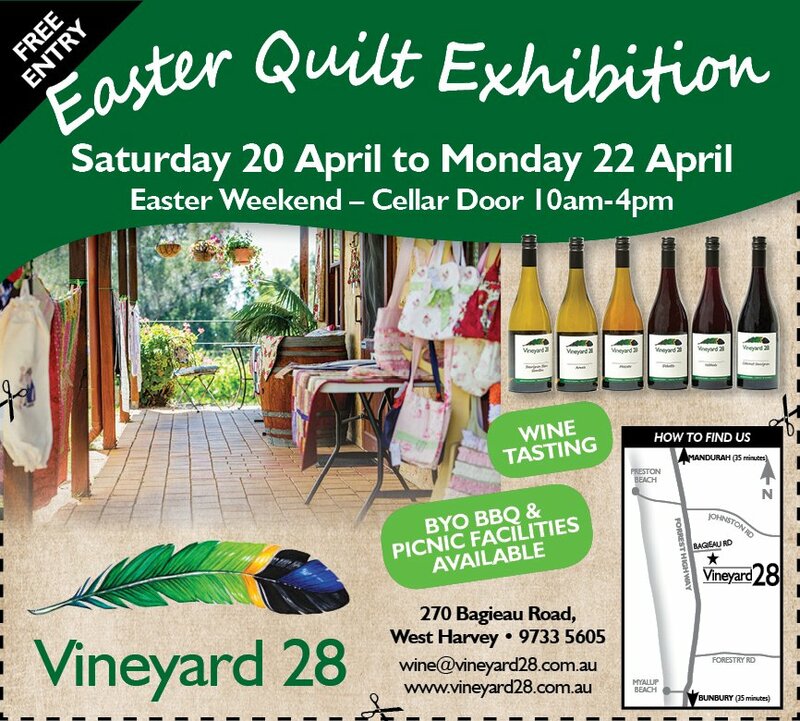 There will be lots happening at Easter Weekend here at the Vineyard 28 Cellar Door with our annual Quilt Exhibition on and Quilt Airing. Come along to cath up on all the latest works by owner, Pippa Nielsen, who has been making quilts for just on 20 years. There will also be new quilts on display and for sale from many other local Quilters from Harvey, Australind and surrounds. The Exhibition will feature various textile works from our resident local artist – Yvonne Chapman. 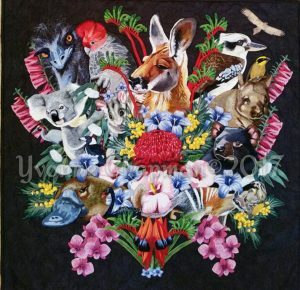 Highlights will be – Australia’s Bouquet, freshly back from touring as part of the 2018 Australasian Quilt Challenge and Carousel, back from touring in America with the World Quilt Exhibition, New Hampshire, where it won an award for best use of colour. Yvonne is a renowned local artist, who works not only in traditional mediums, but has become well known for her fabulous pet portraits and her wonderful textile art creations. Myalup Easter Fair & Myalup Art Exhibition – Come and Explore our wonderful part of the world this Easter. Why not make a weekend of it. Pop down for a day visit, or plan to spend Easter in our region. 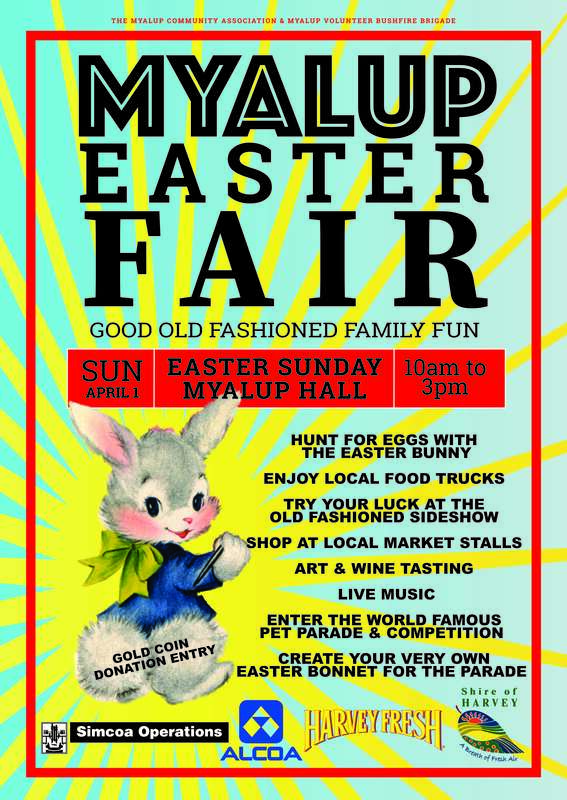 Just down the road from us will be the Myalup Easter Fair on Sunday 1st April, along with the Myalup Art Exhibition – Saturday 31st March and Sunday 1st April. These will bother be happening at the Myalup Community Centre and grounds on Reading Road in Myalup. Myaup local artist – Graeme McPherson will be exhibiting works, along with other local artists from the Harvey Art Society. Graeme worked alongside Yvonne Chapman, as our artist in residence back in September 2017, here at the cellar door. Experience the atmosphere of Italy at the 2018 LiveLighter Harvey Harvest Festival. Vineyard 28 will be there with full range of wines, including our Italian Varieties – Arneis, Moscato, Dolcetto and Nebbiolo. We will be accompanied by other local Geographe – Harvey Wine producers offering our local product for tasting and sales. Set in the picturesque gardens of Snell Park, Harvey, the Festival offers a feast for the senses with arts, culture, food, wine and markets. Keep the kids occupied with rides, street theatre, fairy workshops and an animal petting farm. The annual WA LiveLighter Grape Stomp championships will be on again, offering opportunities for children and adults alike to compete, stomping the grapes. Entry is on the day for this competition. The festival will be located in the picturesque gardens of Snell’s Park, and along Hayward Street, and spill over into the Piazza in our local town of Harvey. Its a great day out for families to come along and experience all we have to offer. Musical entertainment will be offered all day on both the mainstage in Snell’s Park and in the Piazza. 2018 is the 20th Anniversay of the Harvey Harvest Festival, so there will be lots of special happenings to celebrate this milestone. Christmas is fast approaching which means it is almost time for The Vineyard 28 Annual Quilt Exhibition. We are showcasing a gorgeous range of handmade gift items and art which may just be just the gift you are looking for. Why not top up your wine supplies ready for the big day from our range at the cellar door. Don’t leave your shopping until the last minute. If you are looking for something specials, unique and handmade; then Vineyard 28 is the perfect place for you. Christmas shopping really is easy at Vineyard 28. Christmas is fast approaching and here at Vineyard 28 we have all your gift giving covered. Drop into Vineyard 28, we can’t wait to see you. Come along and meet two of Vineyard 28’s artisans and great friends. See and experience how they create their individual works. Yvonne is a renowned local artist, who works not only in traditional mediums such as oils, pastels and watercolours, but also creates wonderful textile art. An opportunity to chat with Yvonne and see her creating in watercolour. Vineyard 28 Owner & Quilter. Pippa has been making quilts for 20 years now, and loves to work by hand. Pippa will demonstrate some of the traditional techniques she uses, and have some of her own work on display. A celebration of all the quilts and crafts completed by members of the Harvey District Creative Arts Centre in the last 2 years as well as our 1950’s House & Apron Challenge. Expect to see some of the beautiful handmade items that made homes so beautiful in the 50’s era. Vineyard 28 owner, Pippa will be exhibiting some of her work there. See you at Harvey District Creative Arts Centre Biennial Quilt & Craft Exhibition happening this March 12 – 20. Don’t miss this year’s exhibition – including our 1950’s Apron challenge. Why not make a day for it and enjoy what Harvey has to offer. Christmas is approaching and here at Vineyard 28, we have a gorgeous array of handmade gift items and art which may just be that something different you are looking for this year. At the same time top up your wine supplies from our range at the cellar door. Can you believe it is only less than 10 sleeps until Christmas? (Even less when you are reading this, scary stuff!). For wine lovers we have a range of 6 different wines from the traditional Sauvignon Blanc Semillon in our white range to Cabernet Sauvignon in our reds to our award winning and famous Italian range of Arneis – a lovely crisp white to Moscato with a touch or pink and then on to our Dolcetto which is a perfect chilled wine for summer and rounding out with our Nebbiolo with a wonderful marriage of cedar and red cherries characteristics. For Art lovers we have our Annual Quilt Exhibition starting Saturday 12th December 2015 through to Sunday 20th December 2015, this year we are featuring Yvonne Chapman who is a local Harvey Artist and her award winning quilt “True Blue” drop in and have a look. As part of the Quilt Exhibition we will have 30 glorious quilts on display and also for sale plus a huge range of other items for you to choose from. Christmas shopping really is easy at Vineyard 28. Drop into Vineyard 28 , we can’t wait to see you. If you are interested in anything to do with quilts. then schedule some time for yourself over these 2 weeks. Great Christmas ideas plenty to see and buy. or just have a picnic.